Spring bulbs. Feed them with an all-purpose 10-10-10 fertilizer as soon as you see them poking through the soil. Pluck off the spent flowers to prevent seeds forming and wasting energy. And let the foliage ripen so it can feed the bulb. Don’t cut it off until it's completely yellow or brown. Spring annuals. As soon as you can work the soil, plant cool-weather annuals like snapdragons and pansies. If you live in USDA zone 6 or warmer, you can plant cool-weather annuals in fall and enjoy them again in the spring. Perennials. Sprinkle an all-purpose granular fertilizer around your perennials as they start to emerge. Keep it off the foliage, though, as it can leave “burn” marks on the leaves. Dahlias. Late spring is the time to plant dahlias. You can start the tubers in containers a few weeks before planting time, or plant them directly into the garden. Stake them as they grow, if your garden tends to be windy. Summer annuals. Time to pull out the cool-weather choices for something that will like the heat of summer, such as annual vinca. Add some compost to the soil and lightly scratch it in. As you plant, soak the roots with a dose of an organic liquid fertilizer, such as fish emulsion, to get the plants off to a fast start. Deadhead? If you don’t get around to taking off the spent iris or amsonia blooms, don’t sweat it. Both have interesting seed heads that’ll poke up through the snow next winter. And the ‘Rozanne’ geranium will keep right on blooming even if you don’t deadhead. Cut back. When the lilies finish blooming, cut off the flower heads to prevent the bulb wasting energy producing seeds. But leave the stalks — just like spring bulbs, they need that foliage to produce food for the plant. Fall annuals. 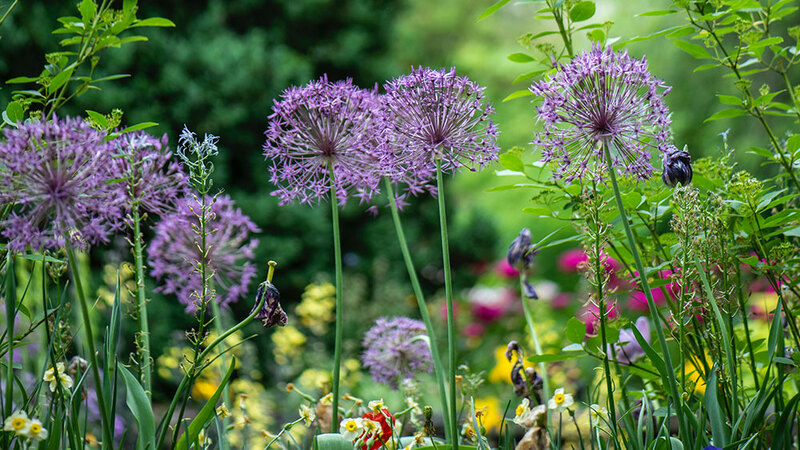 Summer annuals often look great right up until frost, but you may want to tuck in some seasonal plants, such as flowering kale or pansies, for a few extra weeks of color. Clean up. Leave the switchgrass standing for winter interest. And don’t cut back the oakleaf hydrangeas — those papery blossoms will give you something to look at until spring. Plan ahead. Plant next year’s spring bulbs!